Available in various colours as well as Acorn as pictured at this price at time of posting (bright red, Admiral navy, white, pale gold metallic, silver metallic). 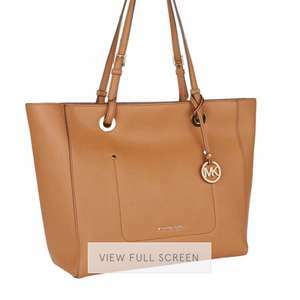 Prices vary by colour but Acorn (Tan) is currently available Fromm Michael Kors at £270. Next best price I found in this colour from a known company was £185.50 (Forzieri in Italy) but postage is £8 4-5 day’s or £12 1 day. I ordered from Harrods in Sunday, paid £5.95 which is included in above price (bag was £129)and received on Tuesday via Parcelforce. Can be found for c£200 elsewhere. Not to everyone’s taste, but good price if it’s what you are looking for. Wow, just checked and all gone - all were in stock when I posted!